There is a keen interest in the ability to construct a 3D Model from a single image. Researchers at Carnegie Mellon have developed a program that allows a computer to automatically generate 3-D reconstructions of scenes based on a single image. 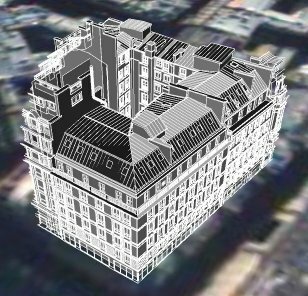 Trimensions, a company specialized in close-range photogrammetry, has developed a tool to integrate three-dimensional models into Google Earth with great precision and detail. They provide a link that enables you to see the results of a model located in Paris, via Google Earth. In another appraoch, the REALVIZ ImageModeller allows you to create 3D scenes from photographs.